Babies R us Flyer Canada -January 11 - 31, 2018 -Medela Freestyle Electric Double Breastpump Model 438219 $484.99 Sale Price Enjoy true mobility with this electric double breastpump, thanks to its light weight design and rechargeable three-hour battery. Customize your experience with this pump's modern features backlit LCD screen. timer, one-touch let-down button, programmable memory and adjustable vacuum controls. Find a handy tote, cooler bag and additional accessories in this hand-free breastpump kit. Medela Calma Bottle Model 078212 $21.99 Sale Price 150 ml bottle. Evenflo Deluxe Advanced Double Electric Breastpump Model 318518 $169.99 Sale Price This breastpump kit comes with its own shoulder bag and insulated cooler plus access to a digital library of education programs. Get your best and most comfortable fit with the advancedfit flange system, which includes a wide range of sizes. Evenflo Advanced Nursing Pads Model 318555 $14.99 Sale Price 100 count. Ameda Purely Yours Breastpump Model 083971 $219.99 Sale Price With carry all. Philip Avent Comfort Double Electric Breastpump Model 028978 $279.99 Sale Price A super-soft textured massage cushion makes the pump more comfortable against skin. Choose from the pumping settings, which stimulate milk flow and let you select what's most comfortable for you. Bonus pack ensemble prime $38.00 value. 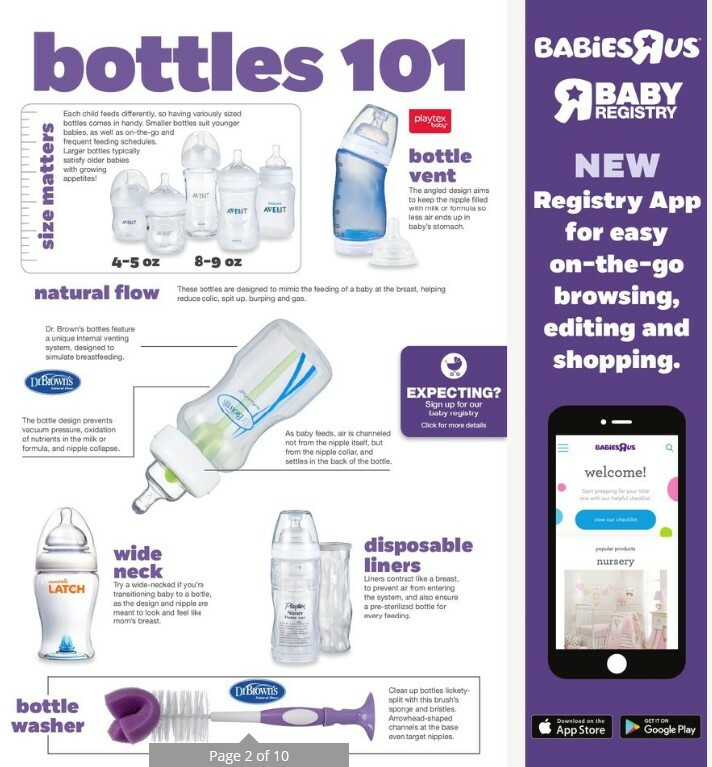 Philips Avent Natural Glass Feeding Bottle Model 091558 $12.99 Sale Price Philips avent natural glass 8 oz feeding bottle. Philips Avent Bottle Warmer Model 112917 $49.99 Sale Price Bottle not included. 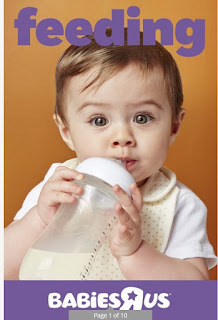 Philips Avent Anti-Colic Bottle Model 380113 $23.99 Sale Price Philips avent anti-colic 4 oz bottle. 3 pack. Nuby Beaded Teething Necklace Model 272251 $13.99 Sale Price The necklace features a plastic clasp for fastening and added safety, making wearing or taking off a snap! 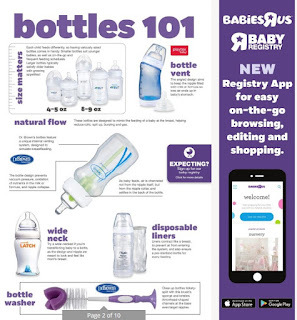 Philips Avent Natural Glass Feeding Bottle Babies R Us weekly flyer Model : 133361 $31.99 Sale Price Philips natural 8 oz glass feeding bottle. 3 pack. Bravado Design Body Silk Seamless Black Nursing Bra Model : 140236 $54.99 Sale Price The luxuriously soft fabric molds to your changing shape, so that you can wear it throughout pregnancy and nursing. Itzy Ritzy Swift Arrows Nursing Scarf Model : 297892 $39.99 Sale Price The Nursing Happens Scarf is machine washable and line drying is recommended for easy cleaning.